In the days of steamer trunks, grand tours by rail and an abundance of porters, nobody cared about the weight of the luggage (except perhaps the porters). Rugged durability and good looks were what counted in those days. That meant sturdy leather, brass fittings and locks worthy of a bank vault. With the norm now being air travel and do-it-yourself toting, weight ranks high on the list of considerations when choosing luggage. Covering long gate-to-gate dashes with your bags is relatively painless when they are on wheels, but lifting is involved when you encounter stairs, a common occurrence if a commuter flight or international travel is involved. And even if you roll your bag directly on board there's that lifting it into the overhead. The last time you flew on a business trip did you, or the airline, lose a Nicole Miller leather jacket? Or how about a snazzy gold pair of Kenneth Cole boots? Or maybe even a Francesco Biasia purse, a WCM leather belt or a double strand cultured pearl necklace appraised at $13,650? Those wayward items of lost luggage have found a home on the sales floor of a one-of-a-kind store, a sort of misplaced baggage heaven where clothes, jewelry, shoes, jackets, cameras, golf clubs and more go to find new lives with new owners. 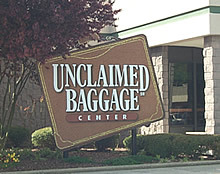 Tucked in the northern Alabama foothills of the Appalachian Mountains is a placed called The Unclaimed Baggage Center. Part salvage operation and part department store, this retailer mines products from luggage lost by airlines or left behind in airports by passengers. Located in Scottsboro, Ala., the 32-year-old company handles about 1 million items a year, with 6,000 new pieces of merchandise – from jewels to clothes to Egyptian artifacts – hitting the store’s floor each day. Shop now. Airlines around the globe mishandle about 1 percent of the 3 billion bags checked each year. Airlines in the U.S. alone lose 10,000 pieces of luggage a day. Although airlines claim to return roughly 98% of lost luggage within a few hours to a few days, it makes traveling, and more importantly, enjoying your vacation, difficult. So, what can travelers do to avoid lost luggage? "Airlines in the U.S. alone lose about 10,000 pieces of luggage a day." The best solution would be to carry on your luggage. But, with carry on luggage restrictions down to specific sizes, for most travelers it is nearly impossible to carry on enough, even for a long weekend getaway. One of the simplest solutions is to Ship it... UPS and FedEx are more reliable than the airlines, and they have much better tracking technology in place. Have your luggage shipped directly to your destination: For a fee, there are many services out there that will ship your luggage directly to your destination, cutting out the airlines all together. Google luggage shipping services. Make sure you research each one to ensure they are a reputable company. UPS & Fedex are most reliable. Use a Global Tracking service such as GlobalTag.com, a unique item retrieval service enabling you to register your valuable items on a secure database. Find all tips here.